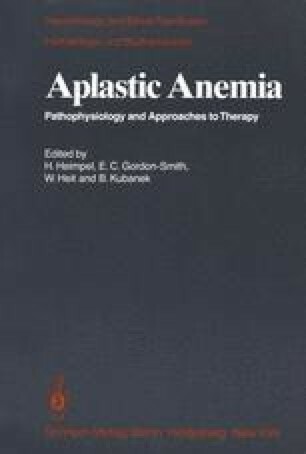 Aplastic anaemia is characterised by pancytopenia with profound bone marrow hypoplasia. This is associated with a reduced number of granulocyte precursor cells (CFU-C) in the bone marrow [6, 2]. While the end-result of a variety of processes may produce this apparent stem cell failure in aplastic anaemia, an immunological mechanism may be responsible in at least some patients [3, 1, 5].